Foam partyWe power foam parties all over the world: in discotheques, in water parks, in entertainment parks, in public open spaces etc. We offer foam generators and cannons in every size, suitable for small parties such as a children birthdays, up to events with well over 5000 people. We also offer rental services for film productions, theatre effects or photo shootings for example. 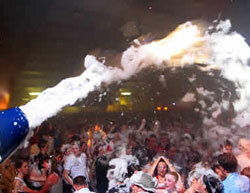 Well known agencies, discotheques, pubs and parks are using our foam generators. There exist different types of foam machines which can be broadly classified into foam generators and foam cannons. Call or write us for quotes or further information!